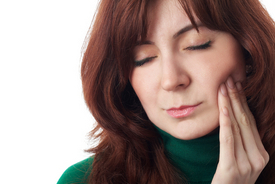 TMJ disorder is an uncomfortable condition that is often left untreated. People who are not familiar with the symptoms and causes of TMJ disorder may be unaware that they are suffering from the condition. Dr. Byron W. Wall, a leading Albuquerque cosmetic dentist, is an expert in TMJ treatment. Read on to learn more about the symptoms and causes of TMJ disorder, as well as the treatments available. The temporomandibular joints (TMJ) refer to the joint that connects the jaw and the skull. The joints are located in front of either ear. These flexible joints allow for free movement of the jaw and make chewing and speaking possible. When the temporomandibular joints stiffen or become misaligned, problems with the jaw, jaw joint, and surrounding facial muscles that control chewing occur. If you are experiencing any of the above symptoms, Dr. Wall can determine if you are suffering from TMJ disorder and go over possible treatment options. The application of cold or hot compresses to the side of the face. Low-level laser therapy to reduce pain and swelling. The use of orthodontics or dental crowns to align the bite. Stretches to loosen and relax the jaw muscles. The use of a mouth guard at night while you sleep; a mouth guard will prevent damage to your teeth and jaw joint by relieving the pressure caused by bruxism. For our patients in Albuquerque, neuromuscular dentistry is an ideal treatment option. Dr. Wall uses a device called a Myomonitor™ to relax the jaw muscle, increase blood flow, and remove toxins from the area. By completely relaxing the jaw muscle, Dr. Wall is able to establish the ideal position for the joint and allow the jaw and teeth to function properly. If these techniques are not successful, surgery may be recommended. If you are suffering from the symptoms of TMJ disorder, you do not have to continue to deal with the pain. Dr. Byron W. Wall and his team can diagnose TMJ disorder and find the ideal treatment. Schedule an appointment today to start on the road to recovery.